Be the first to share your favorite memory, photo or story of Kenyon "Ken". This memorial page is dedicated for family, friends and future generations to celebrate the life of their loved one. GROVER, Kenyon G. "Ken" - Age 84, of Flint, died Sunday, September 2, 2018. Funeral services will be held 12:00 PM Monday, September 10, 2018 at Sharp Funeral Home and Cremation Center, 6063 Fenton Road, Grand Blanc Township. Burial in Great Lakes National Cemetery, Holly. Visitation will be held at funeral home Sunday from 1-4 and 6-8 PM and Monday from 11 AM until the time of the service. Those desiring may make contributions to Kenyon G. Grover Memorial Fund, c/o Sharp Funeral Homes. Ken was born March 30, 1934 in Hadley, the son of George and Leone (Stocker) Grover. 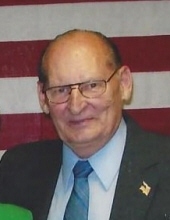 He was a 1952 graduate of Goodrich High School. He was veteran of the U.S. Army. He married Oleta Gay Reed July 29, 1967 at Court Street United Methodist Church in Flint. Ken worked for DeWitt Excavating and Young Environmental for many years. He was a member of the Swartz Creek American Legion Post #294. He enjoyed fishing, woodworking, golfing, poker, and was an avid reader. Surviving are: his wife, Gay; 3 sons, Robert (Andrea) Robinson of Otisville, Richard (Cheryl) Robinson of Grand Blanc, and Randal Robinson of Denver, CO; 8 grandchildren, Rick, Shauna, Amanda, Matthew, Erin, Erica, Allyse, Stephanie, and Jennifer. 8 great grandchildren; sister, Joyce Pierson of Jackson; and several nieces and nephews. He was preceded in death by his parents; 4 brothers, James, Richard, Wayne, and Edward Grover. Tributes may be shared at www.sharpfuneralhomes.com. To send flowers or a remembrance gift to the family of Kenyon "Ken" G. Grover, please visit our Tribute Store. "Email Address" would like to share the life celebration of Kenyon "Ken" G. Grover. Click on the "link" to go to share a favorite memory or leave a condolence message for the family.